A firefighter preparing to descend using a firefighter escape system. Fire Command Training is happy to announce a new firefighter survival training program is now available. 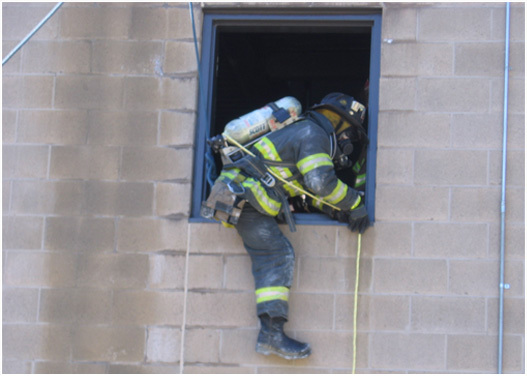 The Firefighter Bail-Out System Training program was developed in response to the introduction and popularity of several new "systems" that firefighters can use to make an emergency escape from a burning building or other hazardous area. There are several manufacturers who have produced brand new escape systems which consist of a rope or webbing, a device, and a substantial object connection point and various styles of bags, pouches and belts. The systems are each quite unique and each has its own special features.